Mix of VIX futures tracked by volatility ETPs up (+20.7%) a factor of 0.30 of the $VIX‘s move (+67.5%). Normal factor around 0.45. $VIX futures are being restrained. Lower factors typical during big vol spikes. The Cboe’s VIX® increase at that point was in record territory, yet the moves of the volatility based Exchange Traded Products (ETPs) and the VIX futures that underlie them had been muted. The 50 minutes that followed the tweet were anything but restrained. The chart below shows the price action of one of the key VIX futures. The VIX climbed to close at a 116% gain and the mix of VIX futures I referred to in the tweet spiked up an astonishing 97% from the previous day’s close. In those last few minutes the VIX’s daily move had almost doubled and the short term volatility ETPs more than quadrupled their percentage moves. At the close, a combined $4 billion worth of the two next to expire VIX futures changed hands. With this unprecedented spike in VIX Futures, the combined value of the inverse volatility ETPs XIV, SVXY, and VMIN dropped billions of dollars. Credit Suisse’s XIV ended up losing 97% of its value that day, ProShares SVXY 91%, and REX ETF’s VMIN 87%. In the weeks that followed, XIV was terminated and SVXY and VMIN reduced their leverage factors to make them less sensitive to big volatility moves. Any major crises has multiple causes, so blaming just one of them is simplistic. In the next section of this post, I describe what I believe to be the primary causes of this debacle. In order to explain how the architecture of these ETPs contributed to this event, we need to dig into how these funds are constructed. ETPs offer investors stock-like access to financial strategies that would be impractical for a retail investor to implement themselves. For example, SPY and IWM are ETPs that track the S&P 500 index and the Russell 2000 index respectively; both of these indexes would be totally impractical for a retail investor to track by buying the constituent individual stocks. These volatility indexes (e.g., SPVXSP) address the expiration and sensitivity issues by specifying a mix of VIX futures that changes every day, rotating out of the next future to expire into the future that expires a month later. This mix of futures is tailored to give a stable sensitivity to VIX moves. Short & margin positions have variable leverage with respect to the moves of the underlying security. For example, if VXXB was to go down 10% per day for two days a short position would make 10% the first day and 9% the second. For more on this see 10 things about short selling. Long leveraged positions have the same behavior—the leverage factor drops if the ETP moves in a favorable direction for the holder. The maximum profit on an un-rebalanced short position is 100%. A short position has the potential of losing more money than was originally invested and that risk is unconstrained. ETP architects addressed the variable leverage and max profit issues by creating daily resetting funds (e.g., XIV, SVXY, TVIX, UVXY). These funds adjust their assets, buying or selling VIX futures near the end of every trading day such that the next day’s leverage will be very close to the advertised level (e.g., 2X, -1X). This reset also enables the inverse funds to achieve more than 100% profit. The ETP issuers address the maximum loss issue (and cover their own backsides) by promising that the ETP’s values will never drop below zero. The daily reset introduces path dependency into the performance of the ETPs. You can’t determine the multi-day end price of the ETP just by knowing the starting and ending values of the index it tracks. For example, a +10% day followed by a -9.09% day leaves the SPVXSP index back where it started, but a 2X daily resetting fund would end up being down 1% after that sequence. Most of the time this effect is detrimental, but occasionally it can be beneficial. In case of huge contrary intraday moves, the ETP issuers need to have the ability to terminate their funds so that they don’t drop below zero. If this happens the shareholder does not benefit if the VIX futures subsequently reverse direction. The transactions required by the daily resetting process have the unfortunate characteristic of a pile-on— they always reinforce the daily move. Both the long leveraged and inverse funds have to buy more VIX futures when VIX futures are going up and sell VIX futures when volatility is dropping—reinforcing the overall market trend. For example, if volatility spikes up the inverse funds would need to reduce their leverage by buying VIX futures or equivalents (to cover some of their short positions) and the 2X funds would also need to buy VIX futures or equivalents to increase their leverage. The “equivalents” to VIX futures are typically something called a swap. They are used by ETP issuers to outsource the resetting process to an institutional counterparty. These swaps are over-the-counter transactions with nearly zero visibility to outsiders. The counterparty will typically hedge their risk with VIX futures or a similar strategy (e.g., delta-hedged SPX straddles). These architectural issues in themselves weren’t fatal, nor were they unknown, I had blogged about them in 2012, but they interacted with other factors that I describe below. 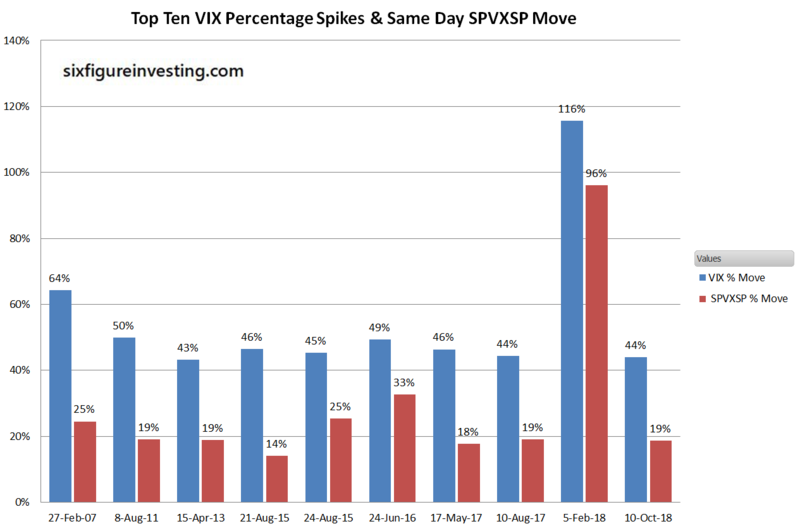 The following chart shows the top ten VIX intraday spikes compared to the SPVXSP index (VIX future based) on the same days in historical order. From their inception in 2004 until February 2018, spikes in the VIX futures -based SPVXSP index had been relatively subdued compared to the VIX spikes. Unlike most futures, VIX futures have a tenuous link to their underlying asset. Soon to expire gold and S&P 500 futures, for example, track the spot “buy/sell it now” price within a percent or two. The only time VIX futures reliably track that close to the VIX index is on the day it expires. It’s relatively easy for gold and S&P 500 futures market makers to precisely hedge their positions with the underlying assets. It’s not easy in the case of VIX futures to do that hedge. You can’t store volatility in a vault somewhere, nor are there securities you can buy that directly track the VIX. You can try to replicate the VIX index with options but to do so requires buying dozens if not hundreds of different option series that carry commissions and high transaction costs. As a result, the VIX futures market tends to have a mind of its own, and historically that market has underreacted to VIX spikes. Analysts did projections of how large of a VIX move would be required before the inverse volatility funds would drop into termination territory (80% or greater one day drop). Typically they concluded an event similar to the S&P 500’s 20.5% drop on Black Friday, October 17, 1987, would be required. The flaw in that reasoning is that it did not ask what can happen. Without a hard and fast linkage between the VIX and VIX futures, there’s nothing that structurally prevents VIX futures from tracking closer to, or even overreacting to VIX moves. In addition, there is the ever-present danger of unanticipated systemic failures—problems not experienced in normal day to day operations. For example, the normal vibration/ acceleration levels in a car are not in any sense a good predictor for the acceleration experienced in an accident. Nassim Taleb points out that unless we have truly large amounts of data it’s foolhardy to use the data we have to predict the variability of possible events (e.g., number of fatalities from terrorist attacks, Ebola infections). We can statistically predict with confidence the likely range of shark attacks we will see next year because there are a lot of people swimming in the ocean and we have decades of data. However, in the case of terrorist attacks, it’s not hard to imagine an event (e.g. a purloined Pakistani nuke detonated in a US city) where there are 100X more fatalities than have ever been experienced (~3000 on 9/11)—an excursion that a standard statistical analysis, assuming a Gaussian distribution, would rate as essentially impossible. The relatively subdued behavior of VIX futures during the VIX spikes of the 2010 Flash Crash, 2011 correction, and the Brexit vote in 2016, led to overconfidence in the marketplace. When analytically reviewing the risk, the mistake that many analysts made (including myself) was to rely on the relatively sparse set of historical data on the VIX and VIX futures. This resulted in overly discounting the likelihood of the VIX futures spiking high enough to trigger catastrophic losses in the inverse volatility funds. In January 2018, the assets of the various inverse and leveraged volatility funds had climbed to over 5 billion dollars. This was publically available information that supported an unsettling scenario. As described earlier in the architecture section, the inverse and leveraged funds internally adjust their positions to accomplish their end-of-day resetting. The size of the required resetting trades is proportional to both the product’s asset size and the daily percentage move of the SPVXSP index. If the SPVXSP index has moved up 10% then both the inverse and 2X leveraged funds needed to buy additional VIX futures equal in value to the previous day’s asset size times the percentage move. If SVXY had 1 billion in assets and the SPVXSP move was +10% then just that fund needed to buy $100 million worth of VIX futures at the end of the day to achieve its rebalancing rules. With 5 billion in assets overall the combined buying need for a +10% move was $500 million worth of futures. These are pretty big numbers for a relatively minor move, how did they relate to the overall size of the VIX futures market? By late 2017 the overall notional value of the VIX futures market was around $7 billion and the rebalancing needs of just one of these ETPs was becoming a significant percentage of the entire VIX futures market. 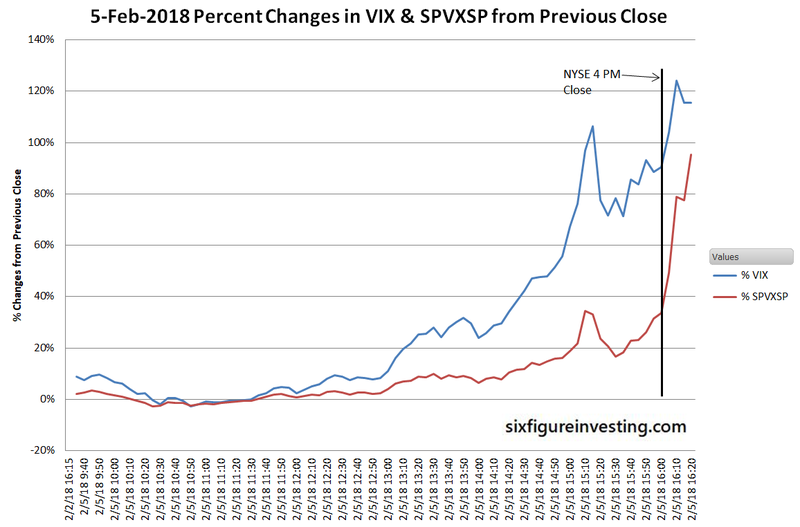 Fifty minutes before the VIX futures would settle on February 5th, the SPVXSP index was up 20% and there were signs that the market was panicking. Unless things turned around there was going to be at least $800 million worth of VIX Futures that needed to be bought by the ETPs or their counterparties at precisely 4:15 PM ET when the futures market closed. It didn’t take a rocket scientist to figure out that prices were likely to climb near the final settlement time. 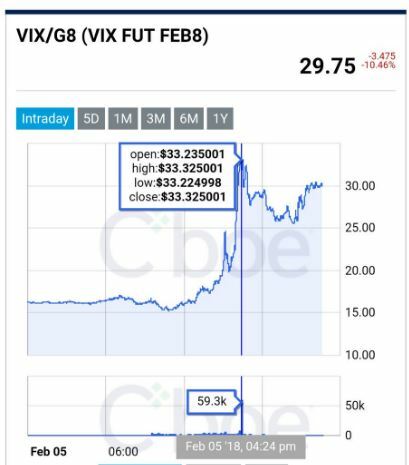 Savvy traders likely bought VIX futures at that point in anticipating the run-up and people already holding VIX futures weren’t in a hurry to sell. The Volatility Tsunami (also known as the Volpocalypse or Volmageddon) required a VIX spike to ignite the explosive mixture of a flawed architecture and high asset levels. The VIX’s February 5th spike was the largest percentage (+116%) and point moves (+20) since its inception in 1993. The coincident 4.1% drop in the S&P 500 that day was far from record-breaking—it’s in 31st place over that same time span. What caused this apparent overreaction? It had been almost two and a half years since the market had had a one day downswing of that magnitude (-3.96% on 15-Aug-2015) and six and a half years since a larger downswing (-4.3% on 5-Oct-2011). The very low volatility before the event had lured traders into complacency. Invest in Vol’s Dr. Stuart Barton makes a case that the hedging required by the volatility ETP market-makers and counterparties could have been large enough to cause a spike in the massive S&P 500 option market. The impact of the VIX spike was to drive the price of VIX futures high enough that massive, end-of-day rebalancing would be required. All of the above causes I discussed above (plus others I omitted or missed) combined on the afternoon of February 5th, 2018, to trigger an unprecedented spike in VIX futures. Exchange Traded Fund managers and counterparties tracking the SPVXSP style indexes ultimately needed to buy around $4 billion dollars’ worth of VIX futures or equivalent volatility instruments at the ~4:15 PM ET futures close. In the face of this unprecedented buying pressure, the liquidity of VIX futures evaporated and VIX futures’ prices soared in the last few minutes of trading. The chart below shows the VIX and SPVXSP price action. Based on historical price data it appears that some fund managers, specifically ProShares’ SVXY and UVXY, as well as REX ETF’s VMIN, stepped aside (or were just not able to fill their orders) and did not complete their purchases that day. If the volatility spike had continued the next day this would have hurt them, but volatility dropped off on the 6th so they ended up saving their shareholders some money with their inaction. The path dependency of the inverse ETPs delivered the final blow to their shareholders. Someone that was short VIXY, a long volatility fund would have “only” lost 45% of their portfolio value on the week of February 5th because in the next few days VIXY dropped back from its peak on the 5th, but since the inverse/leveraged funds reset their investments at the end of the day they locked in the February 5th losses, finishing the week down 95%. Ironically, the potential for catastrophic losses on the long / 2X volatility funds is well known. All of them are down more than 99% since their inception dates. The difference is that long funds don’t crash suddenly; they just get eroded to nothing over time. The day after the crash, Credit Suisse announced that it would terminate XIV, with February 15th being its last day of trading. The -97% move on the 5th clearly entitled Credit Suisse to invoke the “acceleration event” based shutdown of the fund if daily losses met or exceeded 80% detailed in their prospectus. I suspect the decision to shut down the fund was a difficult business decision. XIV had been a real moneymaker for Credit Suisse and likely would regain significant assets after time dimmed people’s memories (SVXY assets have climbed to $377 million as of February 2109). The risk of SEC intervention and positioning for the inevitable lawsuits from the crash might have been the deciding factors for the delisting. By the end of February 2018, both ProShares and Rex ETF (both rumored to be under pressure by the SEC), had reduced the leverage on their volatility funds to decrease the chances of similar drawdowns in the futures. Lawsuits were filed and accusations leveled, but to my knowledge, judgments have yet to be handed down. With the demise of XIV and VMIN (which was shut down in November 2018 due to low assets) and the deleveraging of SVXY, there are no remaining USA short term inverse volatility funds with the same level of architectural risk as the former -1X leveraged funds. My simulations indicate that a February 5th style event would cause the current -0.5X leveraged SVXY to drop 48%—dramatic, but not devastating. People no longer claim that VIX futures are inherently less volatile than the VIX. It only took one event to disabuse them of that belief. Overall, I think this healthy dose of reality has made the overall situation less risky. The assets in short term leveraged / inverse volatility products currently stand at a little over a billion dollars (February 2019), a fifth of the pre-crash $5 billion number. Lower asset values in these funds dramatically reduce the risk of a similar event. The frequency of large VIX spikes has been increasing; seven of the top ten spikes in the VIX’s 27-year history have happened in the last four years. It’s possible that increased asset levels in the volatility funds were a part of this and it very well might be that other factors are at work here. These spikes are a risk to the inverse volatility players and a lure to the long volatility traders. As near as I can tell, the Cboe, which operates the VIX future exchange has not made any improvements that would substantially reduce the risk of a liquidity hole in a similar situation. The Cboe did make a change to the Trade At Settlement (TAS) order type which wasn’t working effectively at the close that day, but I doubt this would have prevented the spike. My sense is that the wheels will still fall off if similar amounts of volatility assets needed to be bought or sold at the very end of the VIX Futures trading day. History rarely repeats itself exactly. What I do expect to see are failures brought about by: not mitigating the weakness of architectures, the frailty of systems when disturbed by unexpected failures, people inappropriately predicting the chances of extreme events using normal day-to-day variations of processes, and of course, fear and greed. Not everyone lost money on February 5th; one firm scored big.